We turned the corner with the calendar just as the sunny light is lengthening and reaching corners it hasn’t inhabited since October. Now I find that we are in that stretch of yearning for springtime…or else hoping for a serious dump of fresh snow. 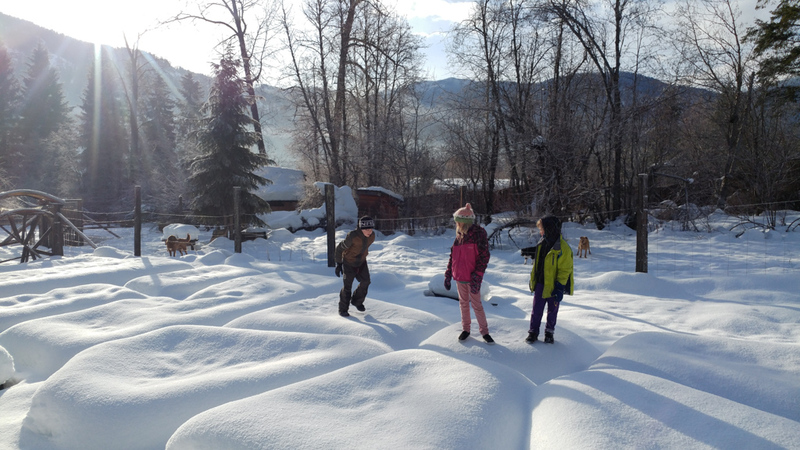 The frozen snow crust is something the kids love to walk on (Huckley declared his favourite time in winter is when he can put on his running shoes and run like he is flying across the icy snow…the urge to freely move our bodies is real). 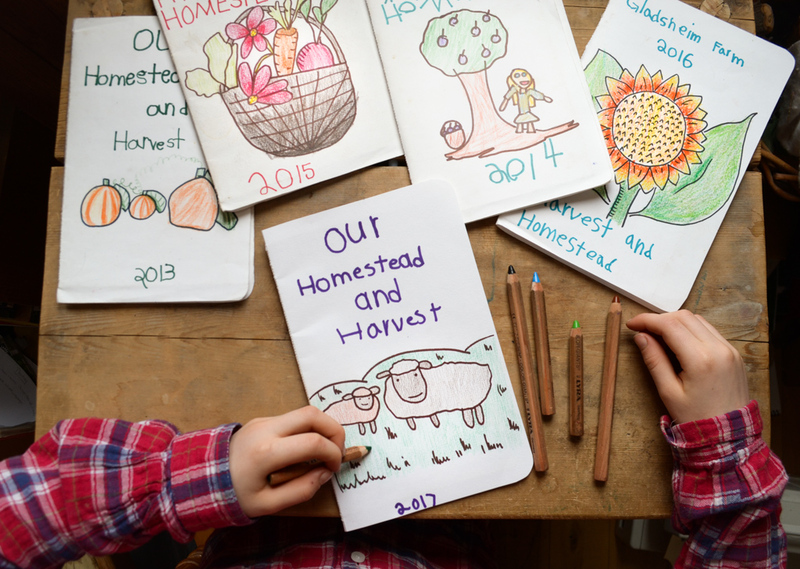 February is the season of taking stock and planning ahead. It is a quiet season, but restless nonetheless. My mind is making lists, inventorying supplies, working through how things may unfold…as much as that is possible. On a whim, in a moment of frustrated disgust, I gutted my pantry. 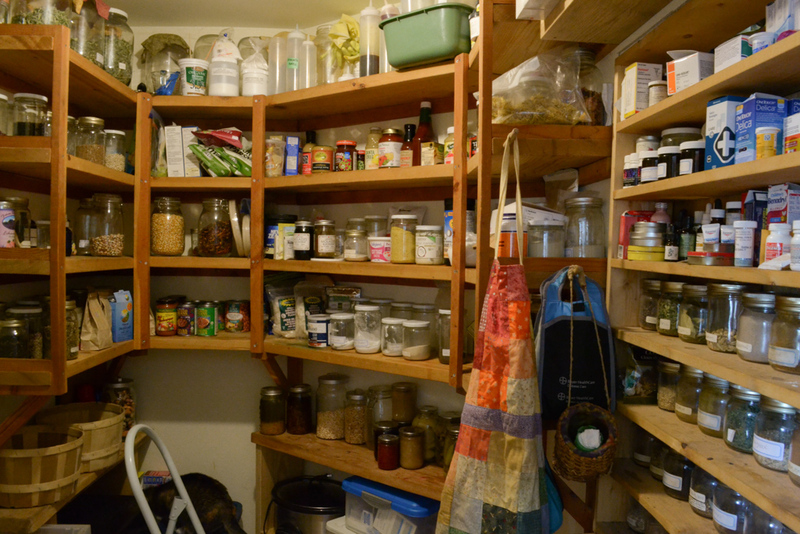 This is a room that holds so much of our life…medicines, food, craft supplies, cleaning supplies, dyeing materials. It is a small space that has not functioned properly for years. Three full days later, I emerged…so content with a thorough job well done that it has been remarked upon how I can be found leaning in the doorway, gazing at the splendor of this one truly clean room in our house. The only drawback is that now the rest of the house seems to be begging for a thorough cleaning. Sighs. One really positive thing about postponing our cross-country bus adventure this summer is that we will indeed have gardens again this season. 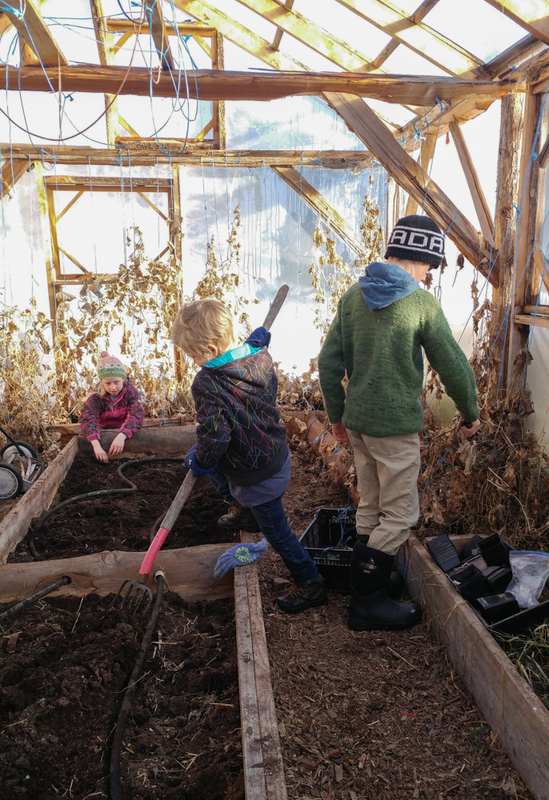 We visited our neglected greenhouse, covered in piles and piles of snow. With visions of my family on the road this summer, I did the unthinkable this past fall and failed to put the greenhouse to bed properly. Now that we will planting things in there in a few months, the kids and I got busy hauling out the old plants. The heavy snowload is like an insulator and it is seriously warm in there! The soil is workable to about 10 inches down…and it smells sooooo good! Something deep inside me awakened from that earthy smell…something that is gearing up to get busy in the gardens and growing food! Later, I climbed the blueberry hill and spent a few moments gazing over the gardens…a favourite daily ritual in the warm weather. 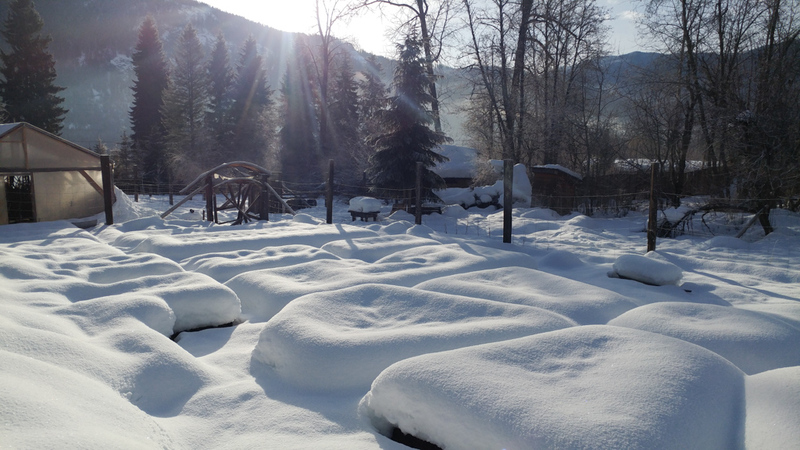 Despite a desert of snow covering all my beds, the potential is enticing…new beginnings. I do love this time of thinking and dreaming and planning and scheming. Luckily, I have a partner in my gardening adventures. My sweet Sunshine is in Grade 3 and her schooling is focusing on gardening and farming. 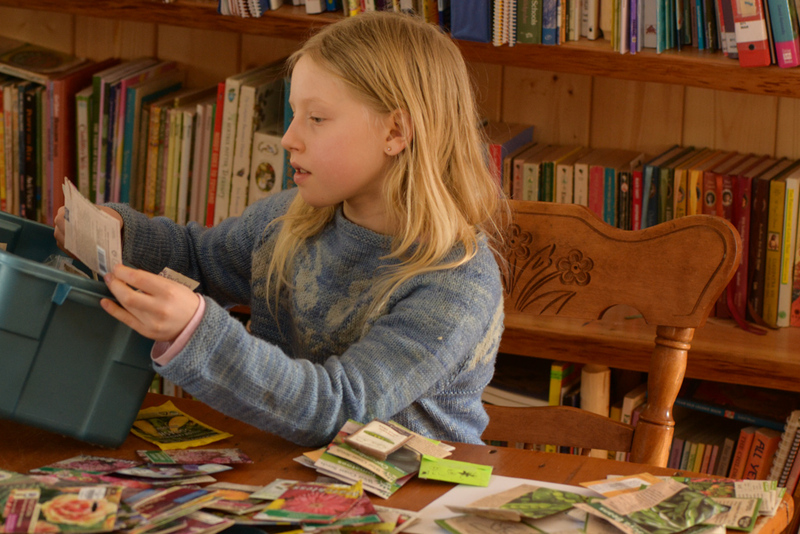 I am delighted that we can actually apply all the permaculture lessons we have explored this year. She is thrilled to have two large beds of her very own and is plotting to apply some square foot gardening practices to maximize all the plants flowers she wants to nurture. During the cleaning of the pantry, I pulled out our seed box and we managed to start some onions, leeks, herbs and a few perennials. 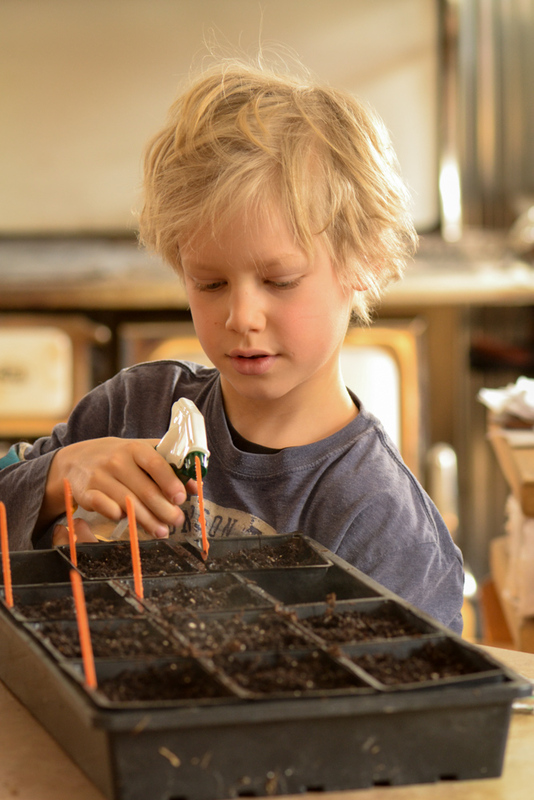 Together, we have been starting seeds since the kids were in diapers so it is a rhythmical part of our late winter life. I love that it is as natural to the kids as hauling firewood and collecting fresh eggs. It is just what we do.